I think I'm going to take it easy this week. Hubs works a lot of nights and my brother is gone for the week. So for the most part, it's just me and the kids. Whenever I am alone, I like to make hummus. For most people, it is a side dish or an appetizer. For me, this is a meal. Some veggies and gluten free crackers and I'm good to go. I just need to decide what kind I want to make. I want to try something new if possible. 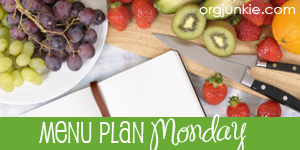 Check out more menu plans at I'm an Organizing Junkie and Shrinking Menu Planning over at Sisterhood of the Shrinking Jeans.